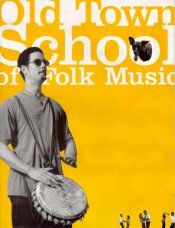 Taylor is a Senior Instructor in the Tam Tam Mandingue Djembe Academy school of djembe. He teaches group djembe classes and private lessons to beginners as well as dedicated (or non-beginner) drummers. Students learn proper hand technique and timing in the context of learning traditional djembe rhythms. These classes also include dunun lessons; dununs provided. Djembe’s may be rented if necessary. Check the following schedule to find a class that’s best for you. For TTM Chicago classes, specifically, there is no pre registration necessary and tuition in on a per-class basis (Old Town School is per-8-week session). What is this logo? Click it to find out…..
All OTS classes are on-going in 8-week sessions and are taught in the style of Tam Tam Mandingue. Sign up through the school by calling the above number. For the latest schedule, get their catalogue. 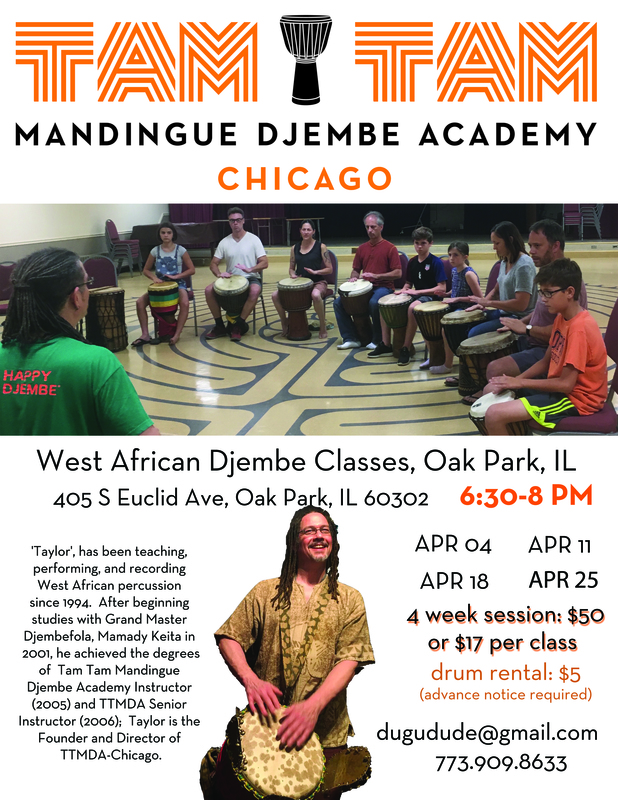 For these classes, if you do not have your own djembe drum, you can rent one through the Different Strummer at the Old Town School on Lincoln. Be sure to reserve it before the session starts. In teaching children and the mentally/physically/emotionally challenged, I have witnessed how drumming expands learning and comprehension; it also builds character. Children acquire discipline, patience, focus, listening, problem-solving skills, and the ability to cooperate. The long-term positive effects that arise from teaching these essential skills through drumming are too compelling to neglect. Currently, I am doing youth programs independently (First Circle pre-school), via the Chicago Symphony Orchestra, the Merit School of Music, the Old Town School of Folk Music, Urban Gateways, After School Matters, and the Steckman Studio of Music(most are not-for-profit music organizations). I serve youth of all ages – pre-school, primary/middle, secondary, college/university, school of life (ie, what I call “seasoned youth”, sometimes referred to as “adults”)!!! To develop a West African drumming course for your pre-school, primary school, high school, university, group home, shelter or any other similar situation (including drum birthday parties), contact Taylor directly at 773-909-8633 or attaylor@holygoat.com. I also have kids djembes, recommended for age 10 and below – usually priced $100-$150 depending on availability. Call Taylor to arrange one-on-one djembe lessons. Locations may vary. $75 per hour. Travel charges may apply. Purchase private lesson online here.